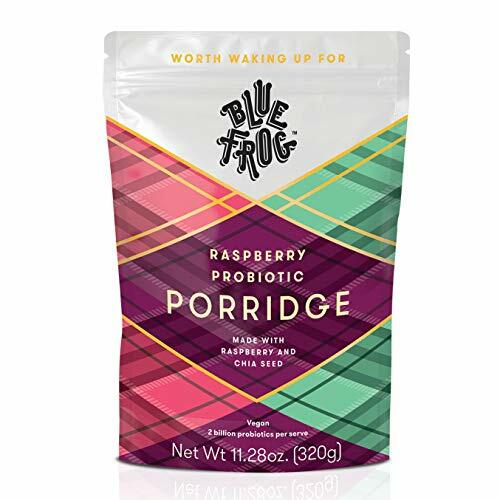 START YOUR DAY WITH PROBIOTIC OAT PORRIDGE - At Blue Frog we understand how busy mornings can be. So we created a vegan approved breakfast that not only tastes amazing but also includes a daily dose of beneficial probiotics. Our award winning, Raspberry & Chia Seed Probiotic Oat Porridge comes in a 11.28oz pack & can be ready to eat in just 2 minutes! Even your kids will love this. TASTY & NOURISHING INGREDIENTS - This delicious vegan & plant-based breakfast not only tastes great, but its super healthy breakfast too! Made from all natural ingredients with no refined sugars, no sulphites, no added dairy & low salt content. Our new probiotic oat porridge contains the mighty GanedenBC30, containing 2 billion probiotics per serve. This breakfast choice is nourishing, wholesome and tastes divine! MADE IN NEW ZEALAND - All Blue Frog products are proudly made in New Zealand with local & imported ingredients. Our oats make up more than 80% of our porridge & are sourced from the Alpine Region of the South Island. No more boring old fashioned rolled oats, this porridge will have you coming back for more. Warming in cooler climes and refreshing as a summer bircher, with all the energy you need to keep going way past breakfast. PREPARE IN 2 MINUTES - Stovetop or microwave friendly. About 1/4 cup per person, Mix 1 part porridge to 3 parts water (or milk) or to your desired consistency. Our uniquely wonderful probiotic GanedenBC30 remains stable on the stovetop and in the microwave, only activating once reaching the ideal conditions in your gut. With more than two billion live cells per serve, here's to happy bellies! THE BLUE FROG GUARANTEE - We all know that breakfast is the most important meal of the day. Start your day right with a serving of this delectable Raspberry & Chia Seed Probiotic Oat Porridge. If you don't absolutely love Blue Frog's Probiotic Breakfast, we'll refund your purchase. It's that good. Add to cart now! Final Price as low as $12.99 Shipped!